Ahhh, rugelach. You’d be hard-pressed to find a Jewish dessert that is more beloved than sweet, flaky rugelach. Yiddish for “little twists” or “rolled things,” rugelach have become a popular dessert in America, enjoyed by Jews and non-Jews alike. They descend from an Eastern European pastry known as kipfel, which is a croissant-like cookie made with flour, butter, sour cream, sugar, and yeast. Sometimes kipfel are filled with fruit or nuts, sometimes not. In the early 20th century, American Jewish cooks took the concept of kipfel and added cream cheese to the dough, resulting in the delicious rugelach we know and love today. 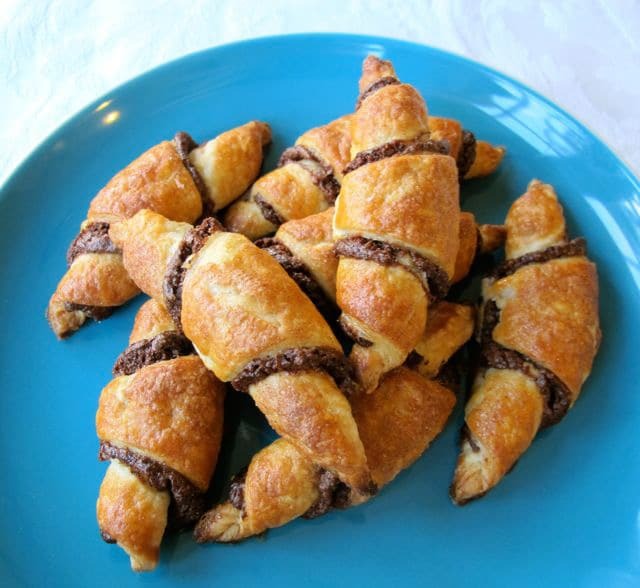 Rugelach are often served on Jewish holidays like Hanukkah and Shavuot, though of course they can (and should!) be made throughout the year. Our family typically serves them during Rosh Hashanah, when sweet foods are made to signify a sweet new year. The rolled shape is similar to the spiral challah served at Rosh Hashanah, which symbolizes the cyclical nature of a year. Some people roll rugelach into a strudel-like form, then slice it to make spiral-shaped cookies. 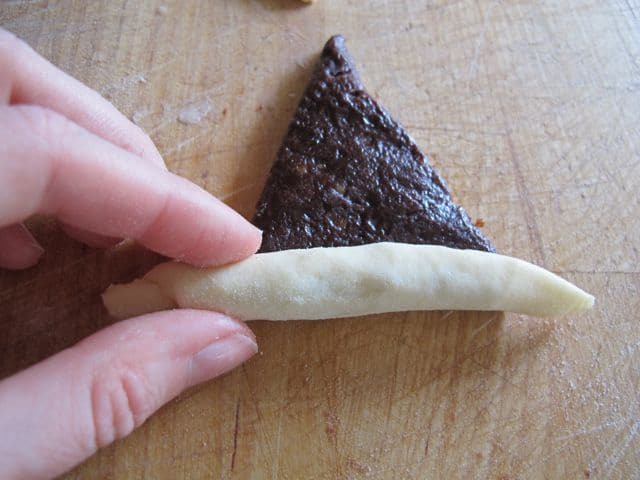 In today’s blog, I’m going to share the method for creating the more popular crescent-shaped cookies. While rugelach filling recipes vary greatly, the dough most American bakers use for rugelach is pretty standard, comprised of equal amounts of flour, cream cheese, and butter. I add a bit of sour cream, sugar, and salt to mine because I like to shake things up. I’m a rugelach rebel! Actually, many people use sour cream in their dough instead of cream cheese, which is more similar to the way kipfel are made. I like to add both because I love the way the dough bakes up– crispy on the outside, soft and flaky and scrumptious on the inside. You’ll love it too. Promise. 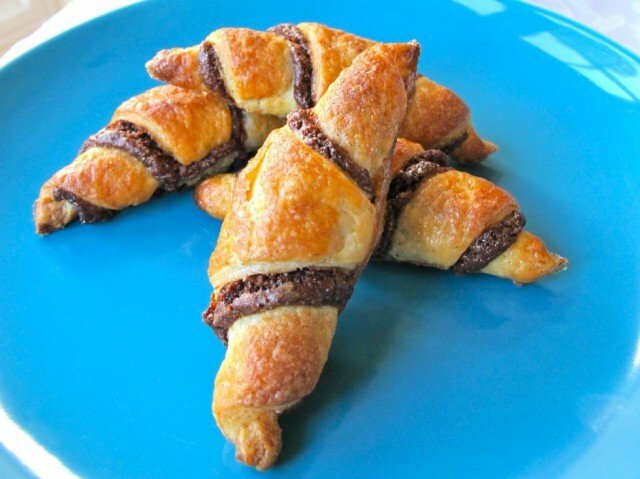 Learn to make rugelach with flaky dough and chocolate fruit filling, a beloved Jewish dessert. Step by step photos. Kosher, Yiddish, Dairy. Yields 50-60 cookies, depending on size. Chop cold butter and cream cheese into smaller pieces. Put pieces into your food processor along with sour cream, flour, salt, and sugar. 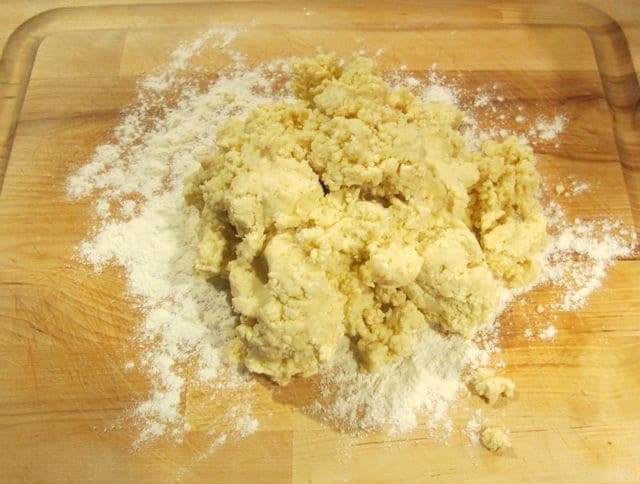 Pulse together ingredients until a crumbly dough forms and begins to fall away from the sides of the processor. 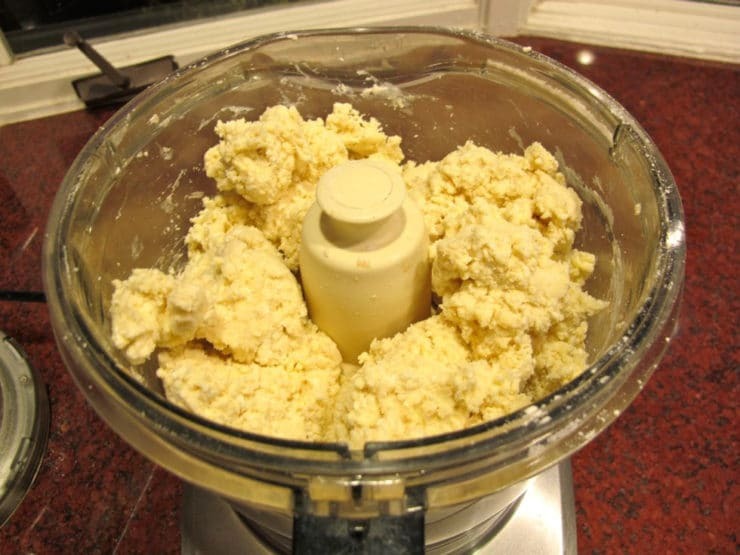 Don't overprocess; the dough should look crumbly, like cottage cheese. and form into a rough ball shape. Divide the ball into four equal pieces and form those pieces into rough balls. Cover each ball with plastic and place in the refrigerator. 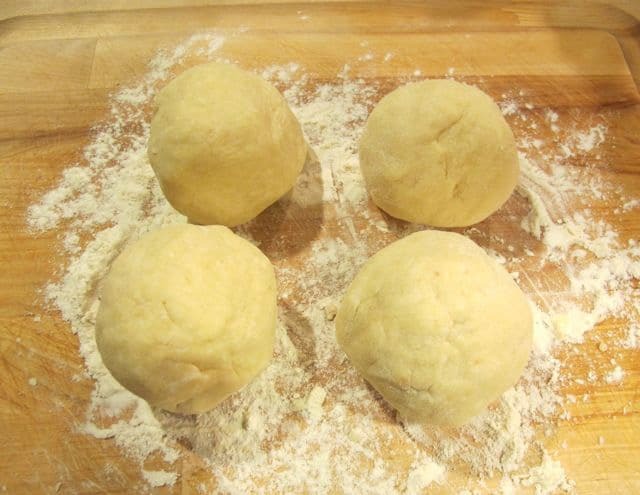 Refrigerate dough balls for at least 1 1/2 hours, for up to 48 hours. 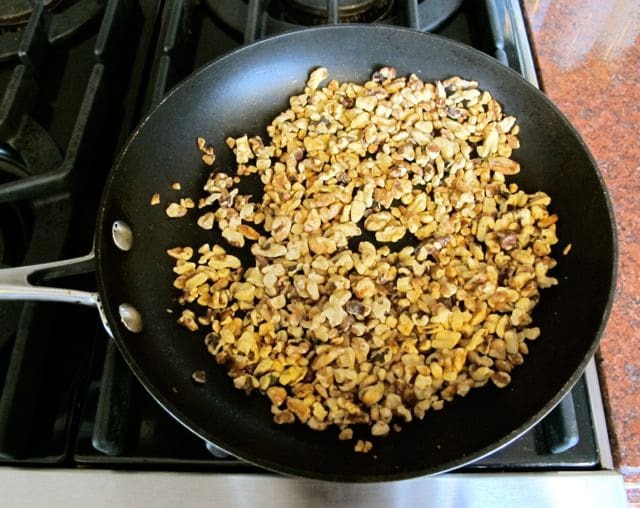 In a skillet, toast the chopped nuts over medium heat until fragrant. 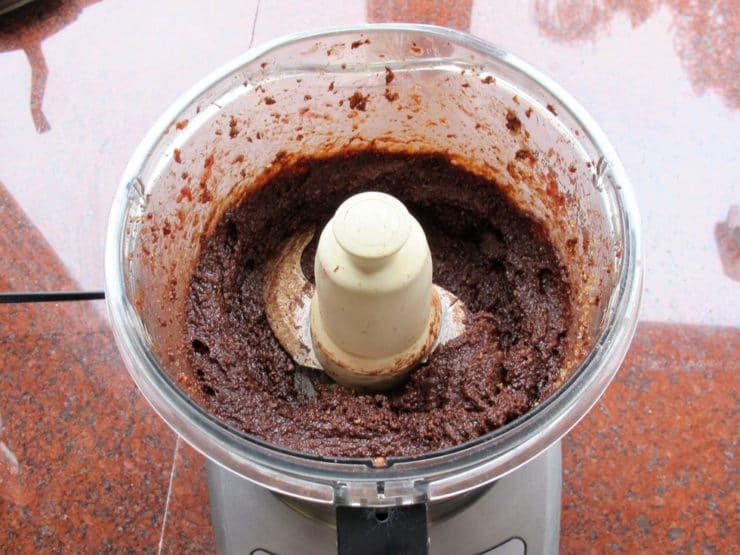 Pour the toasted nuts into a food processor along with the chocolate chips, berry preserves, and brown sugar. Pulse together until a thick, coarse paste forms. Reserve. Combine the cinnamon and sugar in a small bowl; reserve. Beat your egg wash with water; reserve. 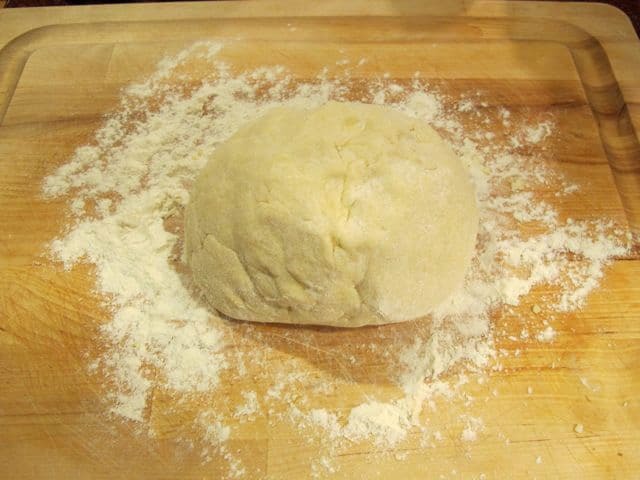 Lift the dough gently from the rolling surface (it may stick a bit) and re-flour your surface beneath the dough. 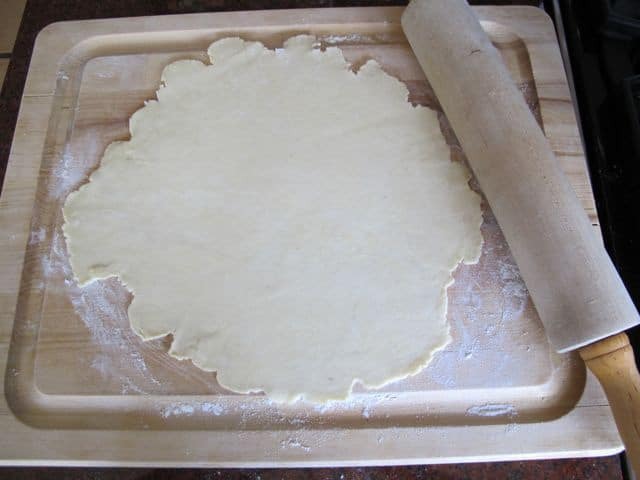 Replace the dough onto the newly refloured surface. 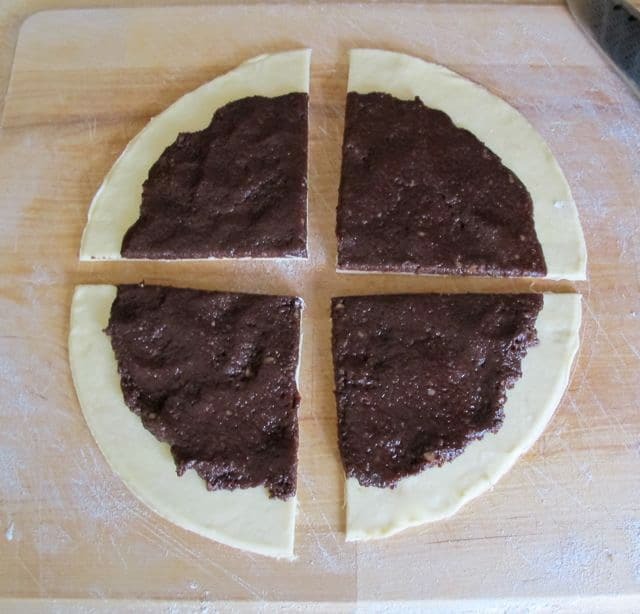 Use a round 9" cake pan as a guide to make a nice, smooth imprint of a circle in the dough. 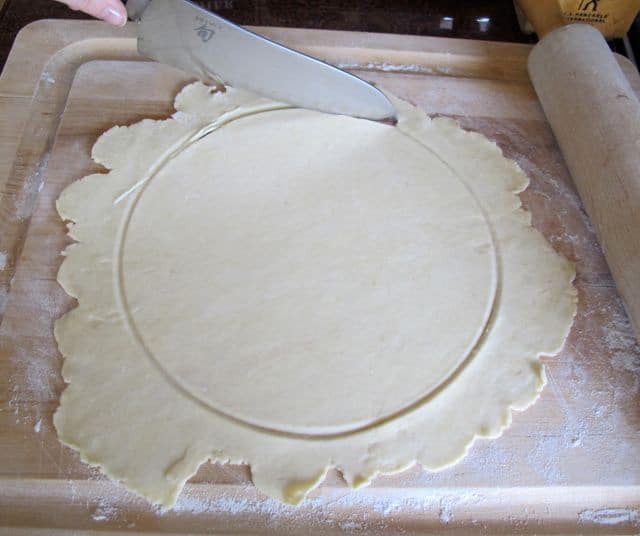 Cut the dough into a large circle, following the shape of the cake pan. 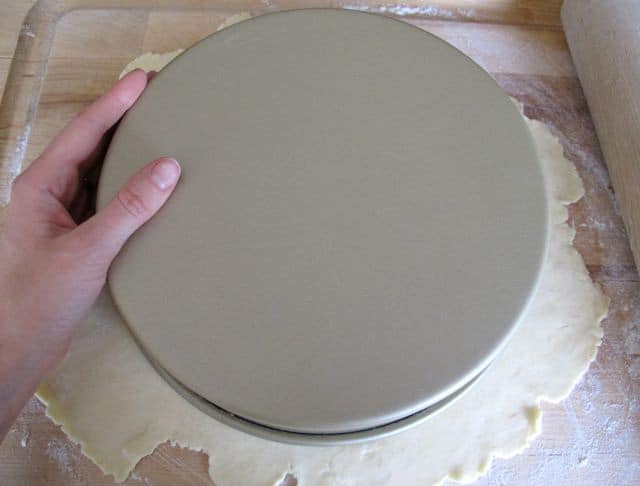 If you don't have a cake pan, just guesstimate the size of the circle and cut it as smoothly as you can. Form the trimmed excess dough into a small ball. Wrap it in plastic and reserve in the refrigerator, adding to the ball with each batch that is made. 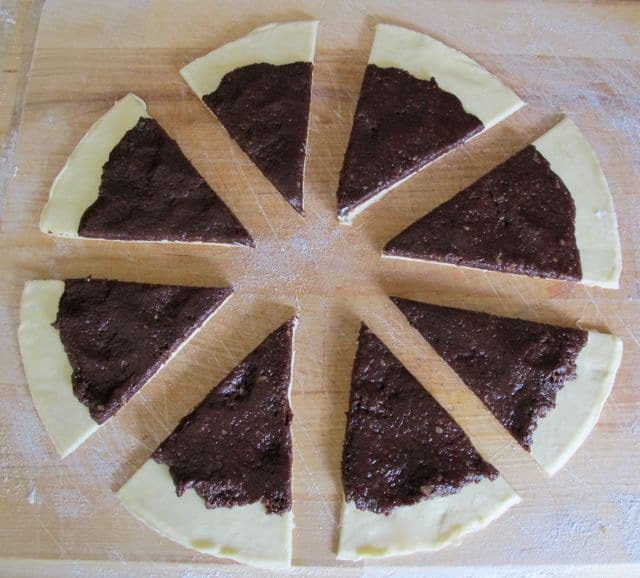 Take 1/4 of the filling (about 4 tbsp) and place it in the center of the circle. 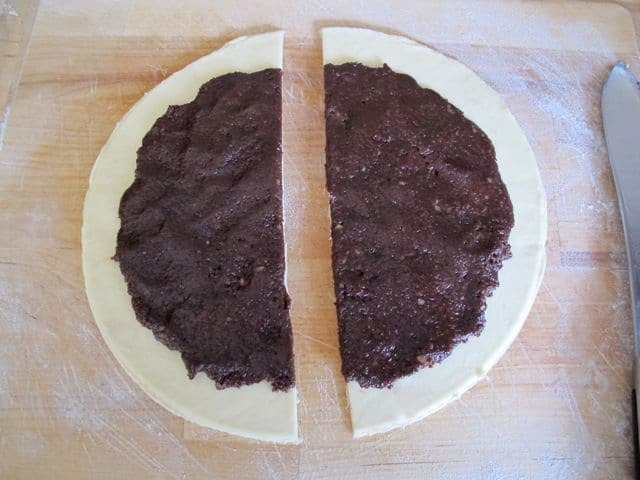 Spread it very thin across the surface of the dough; a thick layer of filling will make your cookies expand and burst. You can use your fingers to make the spreading easier; I like to use my palm to flatten and even out the filling. Leave about an inch around the edges of the circle. then halve the quarters to make eighths. If you prefer to make smaller bite-sized cookies, divide each quarter into three to make 12 equal triangles. Roll each triangle, starting from the wide flat end and rolling towards the narrow point. Press the end point into the cookie to secure it. 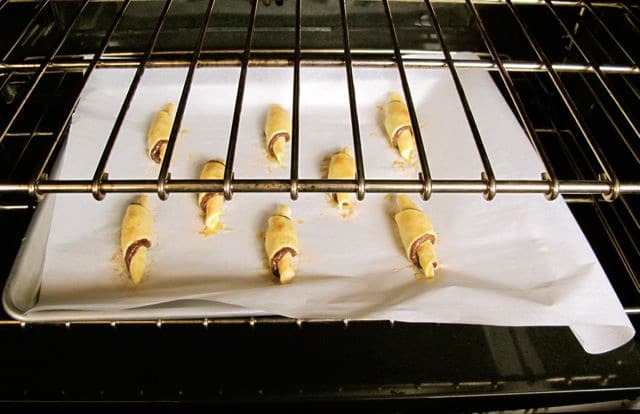 Place the rolled cookies onto a parchment lined cookie sheet, end point down. Leave an inch between the cookies, as they will expand slightly during baking. then sprinkle lightly with cinnamon sugar. Place cookies in the oven and let them back for about 25 minutes, or until golden brown. Roll out your next batch of cookies while this batch is baking. When the cookies are golden brown, remove from the oven and let them cool on a wire rack. If you'd prefer to bake more than one batch of cookies at a time, you can store batches of rolled unbaked cookies (without egg wash) on a cookie sheet in the refrigerator. Egg wash and dust them with sugar just prior to placing them in the oven. When you're finished making cookies from the four dough balls, make a smooth ball from the leftover dough trimmings you've reserved and roll it out to make your fifth batch. These cookies taste amazing served warm and fresh from the oven. They'll keep for a few days in a tightly sealed container. You can rewarm them in the microwave if you want to. Also, feel free to use this dough recipe with other rugelach fillings. If you're using a fruit-only filling, make sure it's an oven safe variety for pastry baking. Using simple jam or preserves alone (without firming them up with other ingredients) tends to make a runny filling that flows out of the cookies, which makes for a goopy mess. If you've never made these cookies before, start with my filling-- it's really yummy, promise! Fabulous Rugelach! I did not care for the chocolate filling so I used raspberry preserves, raspberry liquoure, walnuts, raisins and added some brown sugar. This work out perfect for me. Thank you so much for your basic receipe. I have been looking for a good one for years! I am acquainted with your recipe collection. Your rugelach recipe is not the first recipe of yours that I have made. I have to tell you that you are a culinary Goddess. Wow, Thomas, high praise! Thank you kindly! These were the best rugelach I’ve ever tasted – better than the bagel shops. However, mine were far from perfect. The bottoms were burnt. Is it because they were over-stuffed and leaked, causing the sugar to caramelize, as a reader above suggested? I’m keen to get them just right. Many thanks! Hi, Tori’s assistant Ashley here. It’s difficult to know what went wrong without knowing exactly how they were made, but I’d agree that over-stuffing them would likely cause the bottoms to burn. I’d suggest making them with less next time to see if that helps. Good luck! This recipe is fantastic!! I usually only bake cookies but my husband wanted me to try rugelach (he is Italian and Irish) so I searched the internet and used Tori’s recipe. WOW!! Not only easy and fun to make but taste unbelievable. I even gave some to my friend who is quite a baker and she really really loved them. THANK YOU TORI – I wish you put out a cookbook. BTW I never put a comment out on anything before but, I felt this truly deserved one. My aunt used 3 ingredients. 4 cups flour, 2 cups cottage cheese and 1 lbs butter or margarine. The rest is the same, no egg wash no sugar. 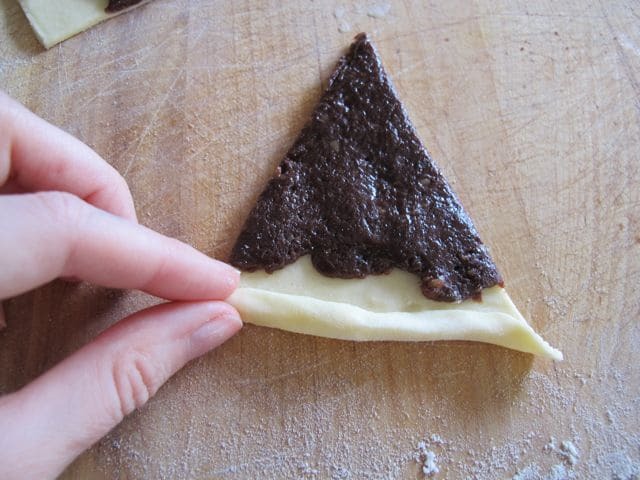 But putting in fridge, rolling and shaping in triangles is all the same. The dough is like velvet. 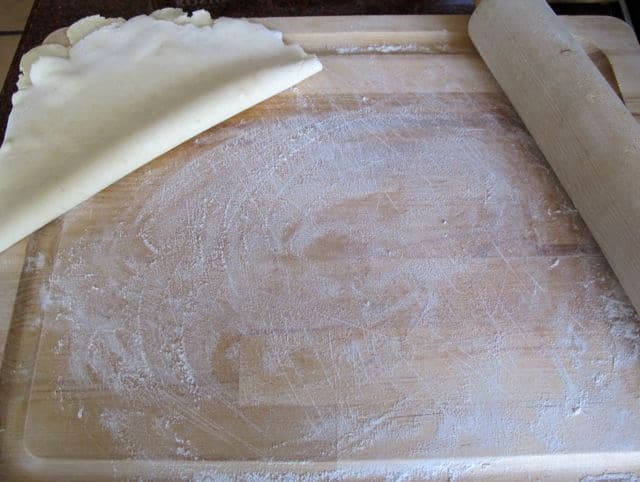 I use the dough for a savory dish, empanadas. Try it and let me know. No sour cream or cream cheese. I think less calories. Not diet but healthier except for the chocolate or raisins inside. Thank you so much for sharing! I wish I could include a photo of my 1st place holiday cookie contest plaque and prize, but you’ll just have to take my word for it! Everyone was saying it wasn’t even a contest, that my cookies blew all the others away. My notes are to begin checking your first batch early. I didn’t and ended up with a totally burnt first batch and semi burnt second. I had to lower the temp 25 degrees and shorten the time by 5 minutes. 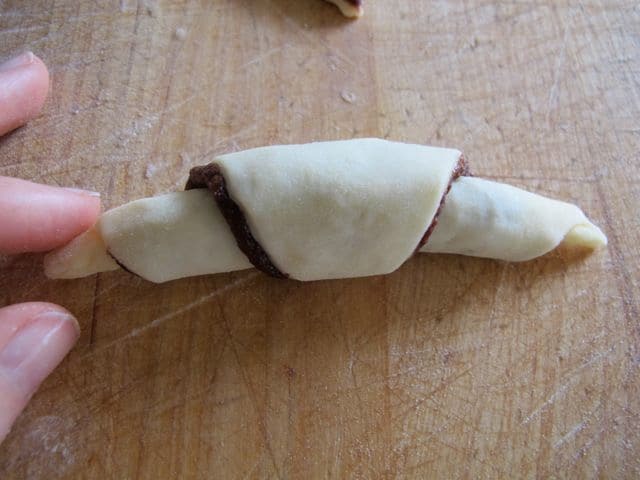 Would it be too much of a good thing to roll these rugelach with Rabbi Olitsky’s Chocolate Chip Cream Cheese filling? Hi Nancy, Tori’s assistant Ashley here! We have not frozen this dough, thought I think that if you wrap it very well before freezing it should be just fine. Let us know how it turns out! can I freeze the dough ? ps. a great recipe, though my filling was: “paint” with apricot jam, then fill with chopped dry apricots and walnuts and cinnamon and sugar. to me , perfection ! Thank you ! Hi Nancy, Tori’s assistant Ashley here! We have not frozen this dough, but I think it would be just fine, as long as it’s stored in an airtight container. Hope this helps! Yes, I freeze it all the time. I just keep the plastic wrap on and then put them in a freezer storage plastic bag. I like to have the dough ready so I make a triple batch of đough …been freezing it for years and it tastes just as fabulous! I have had issues with “neat” looking rugelach for so long, but tried this recipe and “voila” perfect and perfectly delicious. Made these a second time and doubled the recipe…for some reason these disappear ! Tori’s assistant Ashley here. Place cookies in the oven and let them back for about 25 minutes, or until golden brown. I haven’t had these in forty five years since I was 6 years old and my grandma came for a visit and made them. Grandma called them Cream Cheese cookies and I was confused because I didn’t see any cream cheese. I said, “Grandma where’s the cream cheese?” and she said “it’s in the dough”. I had no idea what she meant because I didn’t know what dough was, but when I ate the first one, the taste and experience was burned permanently into my soul. They were simply the best thing I had ever tasted. Though I though about those cookies from time to time, I hadn’t had any since. So the other day when I tried your recipe and tasted my first cream cheese cookie in forty five years, it all came back to me, every detail of the experience, and the taste? They were exactly as I remembered and still the best thing I have ever tasted! Best Rugelach recipe ever !!!! Complete with AMAZING insturctions &* glossy photos !!! THANK YOU for sharing !!!!!!! Do toast the walnuts. Let cool. Pulse with the chocolate until very fine. Put this mix into a bowl and THEN mix in the preserves. I’m too lazy to do the egg wash and they come out just fine. I make rugulah every year for family Thanksgiving and leftover parties. My dough is butter, cream cheese and flour. My filling is raspberry jam, cinnamon and sugar (have it mixed in a shaker), chopped walnuts and lots of mini chocolate chips. Will try your filling with a less sweet taste. Can I make and assemble these with the filling and all rolled up, but not bake until the following day? Will the dough dry out overnight or the filling make the dough soggy? Thx! Lisa I have never tried this, if you decide to try it make sure you cover it with plastic wrap and refrigerate until ready to bake. No promises on results though. Good luck! I have been fixated on these biscuits, so much so that I decided that even on a hot Australian summer’s day I had to bake some. I followed your recipe step by step and TA-DAH–brilliant Rugelach! Even made a double batch of dough so I am letting my imagination run away with filling ideas: cherries, almonds, macadamias, figs–anything goes. Thanks, Tori! Was hoping to impress a special friend who raved about and longed for the rugelach in Israel. Searching I came across this highly rated one so gave it a try. Certainly my attempt wasn’t going to rival anything in a Jewish Bakery in Israel, but with this I did about as best as I could hope for. Not too chocolaty with a hint of mystery with the tang of the Jam. I used blackberry preserves, will try strawberry next time. There are a lot of options for filling, but if your trying for first time, or if you haven’t tried this filing, I think you will be happy with it. I love the idea of combining all 3 items for the filling in the cookies. In the past, I have done them separately, but this was a great idea and they came out wonderful! They looked great and tasted even better! Thanks for the terrific idea. So I’ve made rugelach before butttt I would like to try this filling and I don’t have a food processor. Is there a way to make it without if I just chopped everything up really fine? It would need to be chopped very fine Molly, so that it holds together and is sticky– or you could use a blender. Enjoy! Tori, this is the best Rugelach recipe I have made. I have tried others that were disappointing. I want to thank you as this is easy and so mouth wateringly good. Every time I make these for others I get nothing but the highest praise. Note I said others, as I must get these out of the house after I sample a few……they are so dangerously good!!!! It is the rich dough that has just the right combination of butter, cream cheese and flour, but what takes it up another notch is that 1/4 cup of sour cream!!! 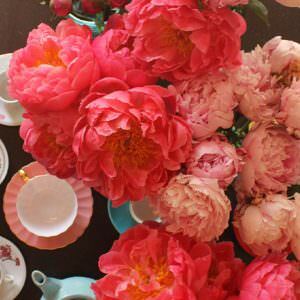 This recipe is requested by many of my friends for their birthdays or other special occasions-they are fabulous! Hi Hanit, thank you I’m so glad you like the recipes. I would love to list the recipes in grams and it is a feature I have in mind for the future, right now I don’t have the staff/time to make it happen but hopefully soon. One standard 1/2 cup stick of butter is 4 ounces or roughly 113 grams. These look amazing. 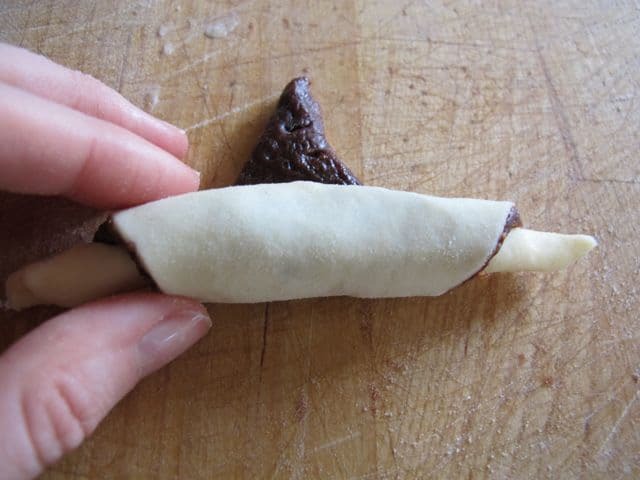 I have made rugelach many times before, but never making the filling a paste. Can these be frozen once rolled before baking or once baked? Or is it a One shot deal, once you make them and bake them that’s it, you must consume them? I was always taught that you can freeze dough but not a baked off cookie but I know many people who freeze baked rugelach. Thanks. Can’t wait to try! Baked rugelach freeze very well. In fact, they taste pretty yummy straight from the freezer with no defrosting! You can warm them in the oven a bit to recrisp them and get that freshly baked flavor back. Enjoy! Holy cow these are insane! I don’t even think I will need the freezer because I cannot stop eating them. These are lethal! Yummy. Thanks so much. You never disappoint! I made this recipe for Rosh Hashanah. Oh my, this is the best rugelach recipe I have ever made and tasted. It was actually fun to make too. 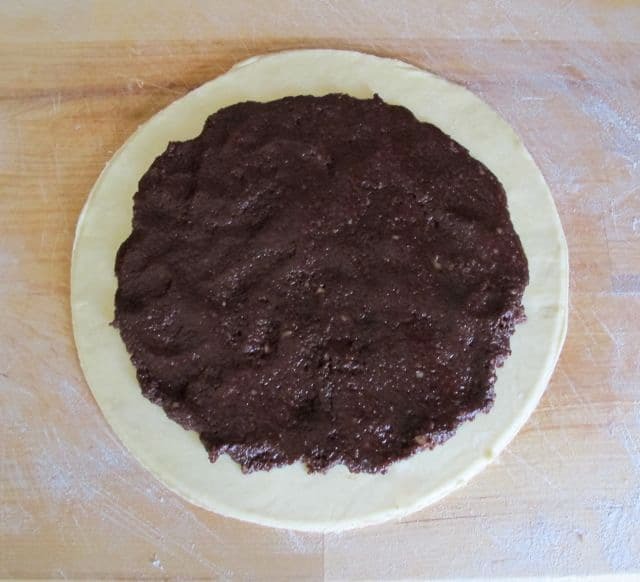 I took Sandra Gold’s tip about taking your choc filling and smooshing it between two pieces of wax paper first and then putting it atop the dough circle. Brilliant! Next time I make this recipe, after putting the dough in the fridge to chill, I would make the filling and prepare 5 circles of filling between wax paper and also put that in the fridge to chill. The first time, I found the filling softened and it was hard to pull the wax paper away and keep the filling circle in one solid piece. These rugelach look amazing. They look like the rugelach from the marzipan bakery in Jerusalem. It’s been 2 years since I went to Israel on birthright and as soon as I get home from school I’m going to make them. Can these be made gluten free by substituting a GF flour for the all porpose type? HAve you heard anyone trying that trick? I haven’t tried it fauxfurr, but maybe another reader will see your comment and respond. Trouble with GF doughs is that they tend to be less flexible than traditional doughs, which makes rolling and shaping more difficult. I realize I’m late to the party here, but I’d like to suggest, if you’re not Celiac, you try using an unbromated, unenriched, unbleached flour. It’s available online if not in a grocery store near you. For many, the problem with flour is not the gluten but the chemicals. I’ve switched to this flour and it’s made all the difference in the world. Just did some research and found a similar recipe for Hungarian kipfel. My grandparents were from Hungary, so maybe my mom got the recipe from my grandmother. Does this make sense? My mom’s recipe for rugelach has 1 stick butter, 1 stick margarine, 3 cups flour, 8 oz. sour cream, 1pkg. Yeast, and 3 egg yolks. It’s rolled out into a circle on top of cinnamon sugar. The cinnamon sugar is also sprinkled on top. It’s delicious but I’ve never seen a rugelach recipe that contains yeast. I’m wondering if this isn’t really considered “rugelach”. What do you think? I have no idea where she got this recipe. Is there a nut free version of the filling that won’t leak? I’d like to make them for school, but it’s a “nut-free zone”. Thanks in advance. Hi Stacey- try toasted sunflower seeds as a sub. Enjoy! I’ve just made the rugelach but it’s several days (5) before I’ll serve them. What’s the best way to preserve them? Freeze them or refrigerate? And then warm up before serving? Hi Sherry, I would double wrap them in plastic, then freeze them. Defrost them several hours before you plan to serve them. You can also reheat them a bit in a 350 degree oven to make them warm and crisp, like they just came out of the oven. Enjoy! I melted the chocolate chips with about a TB of butter….. Easier than trying to get those chips ground up. In my processor they act like pebbles and barely break down. Then combined the melted chocolate with the nuts, jam and sugar. It’s a great filling. Thanks. Hi – I also live in South Africa and am glad Maxine asked you that question – now I know and will definitely try this recipe – sounds great! I live in South Africa and want to know what you mean by Berry preserves. We call it jam, but must it have whole fruit in?? Hi Maxine, preserves and jam are considered the same thing here in America. 🙂 Enjoy! So happy you liked it Irene! You can email me the picture, contact info is here: https://toriavey.com/contact/ I’d love to see it! 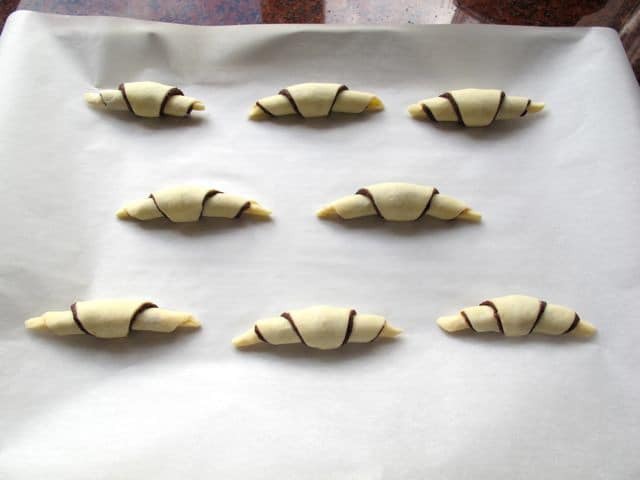 Do you have a parve version of the rugelach recipe? Not at the moment Rosa, sorry. I tried cranberry and white chocolate. I was so afraid that the filling would spill! I decided to add a few T of flour to both the dehydrated cranberry-turned jam filling and the chopped white chocolate and walnuts. It was flawless, not a touch of leaked filling. Thanks for the great recipe! Do u think gluten free plain flour will work for the rugelach dough? Sounds a little like the cream cheese dough recipe for Hungarian pastries my Ma used to make. So I absolutely adore your website. I’m in a history phd program and I am a little obsessed with Jewish culture and history so obviously everything about your website is right up my alley. I made these today (I halved the recipe but I wish I hadn’t!) and they are INCREDIBLE. And surprisingly easy! I did wind up futzing with this one and about six other recipes and also what I had in my pantry. Man, are these the best! I used a vegan recipe for the dough but I used your filling recipe and you’re right – it is THE BEST! I was going to make half of the dough with your filling and the other half with a different filling, but after tasting the first batch, I made them all with your recipe. Thanks so much! Thanks for the awesome recipe and all the pictorials. They look absolutely delicious and I cannot wait to make them. I used to buy these at Canters, but to tell the truth my moms rugelach was always my fave, but your recipe is so close I can taste them as I read your post! I am going to have to make these and take them to mom and tell her I made them and she will flip cuz I have never made pastries or cookies in the past. Great recipe and you have a nice blog. Since you shared the link for this on Facebook in your salmon recipe’s comments, I knew I had to make it. I made these today. Wow, took quite a bit of effort, but they were absolutely delicious! I need to work on my technique a bit because they weren’t all very pretty, but they were delicious nonetheless. I think the filling was a bit thick to spread into a thin layer, but I will try to play around a bit in the future. Absolutely delicious though, thank you for the recipe! Yummy! This really sounds good! I would like to try it!! with prunes we used to live in Brooklyn N Y. I’m now in Miami Florida. 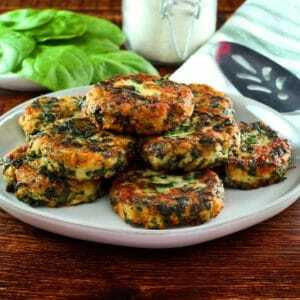 And the recipe is great…………….THAKX AGAIN!!!!!!!!!!!!!!!!!!!!!! I adore Rugelach and since I moved from NYC I no longer have it. There was a great kosher bakery on W 72nd that I used to pick up apricot Rugelach on my way to work many years ago. Thanks for recipe but the idea of me doing that many steps is…highly unlikely. Cheers! 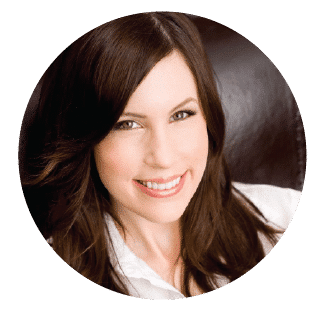 This comment is for Dana – And a question for Tori! I think the bakery you’re talking about is one I dream about often — Lichtmann’s!! If it’s the one you’re referring to, they also made THE BEST Chocolate Babka!! Not like any I’ve come across — chocolate was almost a syrup! Tori, can you help with that? My friend who lived behind Canters used to bring these to me everyday!! Sooooooooooooooooooooooo good. The recipe isn’t as difficult as I thought it would be, so I can’t wait to try to make them! You make it look so easy, from start to finish! I made mine with nuts and marmalade. They oozed, made caramelized puddles on the bottoms that turned into burnt sugar, that glued them in place. They were too good from the scorched bottoms, up, to throw out though. No idea what went wrong. Will try them again. I like the ones from Whole Foods, but nothing beats homemade. These sound just wonderful. I was wondering what to bake special for my hubby when he plows our snow filled Maine yard tomorrow.. He will love these from the sound of the ingredients! Thank you so much! I feel like I am snoopin’ around in your kitchen..
Start selling this prepared online! I have made several flavors of rugelach one with dried blueberries, blackberry jam,cinnamon and ground nuts and they are incredible and full of antioxidants .! Looks wonderful. Is there a substitute for the cream cheese and sour cream to make it pareve and still turn out so good? Melissa A., There is no substitute for the cream cheese and the sour cream. Look on the wrapping of the cream cheese (Philadelphia brand recommended) for pareve notice and also on cream cheese label. These are milch. You can’t serve them with a meat meal. Karen, Melissa is asking if there is a pareve substitute — she’s aware that cream cheese and sour cream are dairy. I didn’t answer her question because I haven’t tested this with dairy-free cream cheese or sour cream (both of which exist– Tofutti brand is certified pareve for both sour cream and cream cheese). The fat content is different in pareve products, so I can’t offer my advice on substitutes. They may work, I just haven’t tried them myself. My mom used to make a yeast rugelach dough which is parve since she doesn’t eat cream cheese or butter. If Tori can’t find a recipe, I’ll check with my sister since I’m all about the butter and cream cheese. Always been curious about these. Thanks for the enlightenment. Don’t Modify!!! In a moment of guilt about fat some years ago, I tried making these with low fat cream cheese and margarine. They were horrible. I just tell people each cookie has 1200 calories (not really) and to enjoy them but eat fewer. They are my favorite cookies. Looking forward to making these! Thanks for the excellent…as usual…instructions! Jackie, you could certainly make an almond filling for this, as long as the filling is somewhat firm and not too runny. Very wet fillings will drip out of the rugelach and make a mess. Many people like to use a combination of nuts, raisins, and cinnamon as a filling. I’m a fan of the chocolate myself, but they’re all good! Diane, schneken are very similar to rugelach– the big difference is that schneken dough is made with sour cream only instead of cream cheese or a combo of cream cheese & sour cream. Schneken are more like kipfel, which are the predecessors of rugelach. But you’re right that they are very similar! I am sure it must have tasted great. Wow so much of effort on those pretty Rugelach. Very clever idea to use baking pan and cut it into pieces. Love your pictures made it even more easier to follow the recipe. Perfect. Mmmmm try different fillings too. I love to make these with pineapple jam or marmalade–lemon or orange are good–with some chopped candied or crystalized ginger! First, these look delicious and I’m definitely going to try them. But I have a question for you: how are rugelach different than schneken? I see pastry that look very similar labeled as each of these. Is there a difference, or are they two names for the same thing? There’s a cookie with an almond filling….would this be one that can be used for that?